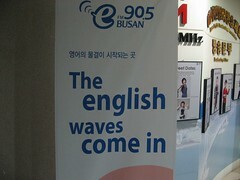 This should have been my last week at Busan e-FM. They’d reached the end of their six-month season and this is when they shake things up and change around the schedule and even some of their staff, but they persuaded me to sign on for a second season, or as I think of it, 52 more hours on the subway. I wasn’t keen on the idea initially simply because during my time on the air I’d been primarily talking about my experiences, and I felt like I’d covered most of the major topics such as social responsibilities, festivals, health, technology and so on. But - apparently – the new season afforded me the scope to sometimes talk about a wider range of issues that weren’t anchored so much in personal experience as personal opinion and current events. At least in principle. I’ve developed a sense that when you think you make agreements here the other end of the bargain is perhaps... a little more fluid than one might normally expect. But as such, there was a change of tone this week, at least. This is the last of my mad month of daily 7.30pm posts, because I’ve now caught up to reality. Possibly. This week I’m going to talk about Japanese radiation, Mount Baekdu, living long-term in a country like Korea, and escape plans. I don’t have an escape plan. I don’t know if I should. But recently we had the Fukushima nuclear accident, and because of that there were fears for Tokyo. It really never looked like there was a risk of high fallout levels in Tokyo – but of course there’s always a chance things could change quickly, and then maybe it’s too late. But what surprised me about Fukushima was how quickly foreigners got out of Japan. They showed little loyalty to their Japanese colleagues, friends and family. Loyalty is important in Japan, and I believe it’s also important in Korea, where you have family loyalties, loyalties to companies, so many loyalty cards and programmes, and of course, the importance of brands. So I wonder, what happens when these foreigners go back to Japan? Are they accepted back so easily? We have a phrase in English - ‘fair-weather friends’, which basically refers to the way some people will happily be your friend in good times, but not when times are bad. It’s not just a Japanese issue; Korea has nuclear power stations as well and just this week there have been a number of ‘issues’ with the Gori nuclear plant here in Busan [it seems not an isolated case]. There are other factors at work in Korea as well. A year ago, after North Korea’s attack on the Cheonan I was reading foreigners on an Internet group here discussing what their escape plans were. Some were highly detailed descriptions, referencing American Embassy communications and plans. I don’t really get the same kind of communications from the British Embassy. Reading these comments, I realised what a serious issue it was for some people. But what does it mean about how much loyalty we have to our lives in Korea? Then, after the North Korean attack on Yeonpyeong Island, there was a newspaper article about expat evacuation plans. Perhaps these plans will never have to be put into operation, but the fact that Korean newspapers are highlighting how ready we are to leave doesn’t make us look good. Of course, I understand that it’s naturally a big issue in Seoul. But what’s interesting about that is how many expats there think that Busan will be safe – I don’t think that’s necessarily true. They have plans to come to Busan in the event of an attack, but over Seollal I read that it was taking eight hours to drive from Seoul to Busan [unfortunately I didn't remember this correctly, it was the other way - Busan to Seoul - but I'm sure the principle holds true]. I think if something suddenly happens it might take them eight hours just to get out of Seoul. Then there’s the potential eruption of Mount Baekdu. There should be more warning with this, but the damage could be greater. Eruptions are measured in terms of the Volcanic Explosivity Index, or VEI. So-called supervolcanoes such as Yellowstone in the U.S. and Toba 74,000 years ago that possibly killed an 60% of all humans at the time, have had a VEI of up to 8. Mount Baekdu is thought to be capable of an eruption of up to 7.4 on the VEI scale. To put this into context, the eruption in Iceland last year, which caused massive problems for flights in Europe, had a VEI of 5. The scale is logarithmic so one point in magnitude equals ten times the difference. In other words, Mount Baekdu’s forthcoming eruption could be over one-hundred times more powerful than Iceland, so the damage could be considerable. There’s evidence that an eruption could occur in the near-future, geologically speaking. Since 2002, there has been a 10cm rise in the mountain’s height, there are reports of many dead trees on the Chinese side of the mountain, and the frequency or earthquakes has increased noteably. Satellites have detected a temperature rise in the mountain. Some politicians here have tried to say that a Mount Baekdu eruption won’t be a problem for South Korea [although clearly there is concern], but this doesn’t seem to be borne out by history and logic. In its eruption just over 1,000 years ago, the volcano created enough ash to cover the entire Korean peninsula up to a height of 1.2 meters. Now to be fair, in the event of a similar eruption not all of that is likely to fall on Korea – although it depends on wind direction. But any eruption is also likely to cause a mini volcanic winter, rising food prices and the temporary breakdown of infrastructure. And that’s not the only issue with this – China is building nuclear power stations only 100km away from the volcano. So again in connection with Mount Baekdu, this question comes up – do you leave, and what happens afterwards? Japan has a strong clan culture if I can call it that. There’s a high value placed on belonging to a social group, and taking part in activities such as drinking, karaoke, eating and so on. It’s the same in Korea. You’ll always be a foreigner, but you have to try and be an honorary member of the Korean clan. It’s like that movie The Last Samurai – you know, the one with Tom Cruise. Actually, that was based on the life of Jules Brunet, who was French – and this is an example [yet another example] of the way Hollywood is Americanising history. In other words, as a cultural superpower America is re-writing history in its image. And this reminds us of an important lesson – history is written by the victors. Now The Last Samurai is just a movie, but what kind of ending would it have been if as the Japanese clan leader – Katsumoto – is preparing for the final battle, Tom Cruise’s character says “well good luck, I’ll be up on that hill watching”? Of course, his character has to ride into battle with the clan leader – the major point of the film is loyalty. So should I be loyal to Korea? Maybe. But I don’t know where you draw the line. Based on the science, I’m sure I wouldn’t have left Tokyo. And if something happened with North Korea or Mount Baekdu, again, maybe I wouldn’t want to leave. But I admit, it was an easier decision when I didn’t have a baby son. Now I do, but what about my Korean family and friends who have nowhere to go? And how do they treat you when you get back? But... I used to read about people who’d been in Japan for twenty to thirty years, and they often said ‘it doesn’t matter how Japanese you become – you’ll never really be Japanese’ [or fully accepted by them], so maybe that’s a significant issue to consider, because although I haven’t been in Korea long enough, I suspect the same is true here. We’ll always be treated as outsiders – so maybe it’s OK that we make these plans. But from what I’ve read foreigners saying in Korea, and what we saw recently in Japan, it’s surprising just how quickly some people are ready to run. [The day after I did this segment on Busan e-FM, the following story appeared in Britain’s Daily Telegraph: “Rebuilding Japan: Special scorn for ‘flyjin’ foreigners who fled country”].